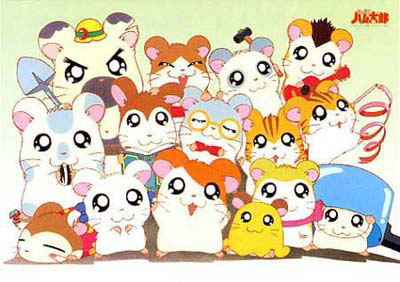 Hamtaro is the story of Laura, a 10 year old girl and her pet hamster, Hamtaro. While Laura is away, Hamtaro is at play. You will most likely find him playing with his hamster friends, the Ham-Ham gang. When together, they go on many adventures and help each other out. Popular in Japan for the past few years, Hamtaro is making his way over to the U.S. This guide is tailored to the U.S. version of the show, specifically the episodes shown on Cartoon Network. Although there was never any official announcement, Hamtaro is most-likely cancelled. The program hasn't aired any new episodes for around three years now and there is no indication that any further episodes will be produced. Hamtaro (Hamutarō? 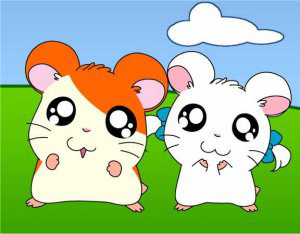 ): (Seiyū: Kurumi Mamiya, Voice Actress: Chiara Zanni) - Owned by Laura, Hamtaro is one of the more courageous Ham-Hams, Hamtaro is always ready to help out his friends and his owner Laura. However, he cannot stand being ignored by Laura. He is clueless about many things, especially love (much to Bijou and Sparkle's dismay). There is a lot of evidence in the show that Hamtaro most likely has an enormous crush on Bijou. In the Japanese version, Hamtaro ends his sentences with 'na no da', a phrase often used by playful characters (such as Ryuichi Sakuma from Gravitation, Zatch Bell from Zatch Bell! and Pudding Fong from Tokyo Mew Mew). This is changed to, "ham-ha! ", "Heke! ", "Pakapaka", and "kush kush" in the English version. Koushi (Kōshi-kun? )/Oxnard (Seiyū: Rikako Aikawa, Voice Actor: Saffron Henderson) - Owned by Kana. One of Hamtaro's best friends in the series, he has the biggest appetites of the Ham-Hams, and also has a crush on Pepper. He was originally an easily frightened Ham-Ham, but he has been braver and more dependable in recent episodes. He has a talent for tarot card reading, which soon attracts the girls, much to the dismay of the other boys. Most of the time, Oxnard's predictions come true, especially for Boss (and usually end in Boss getting hurt in some way). In the final episode, he marries Pepper. Taisho ( Taishō-kun? )/Boss (Seiyū: Kentaro Ito, Voice Actor: Ted Cole) - a field hamster. The self-proclaimed leader of the Ham-Hams, Boss has a huge crush on Bijou. He often tries to look like he knows everything, only to have it backfire in his face. He has a bit of a temper, but he is very dependable, courageous, and nice, even shy at times (especially around Bijou). Because he is a field hamster, he is more familiar with nature, and is more independent compared to the other Ham-Hams. He has even developed a field hamster sense that tells him what kind of weather is approaching, much like Spider-Man's spider-sense. However, he cannot deal with the sea as he is prone to sea sickness. 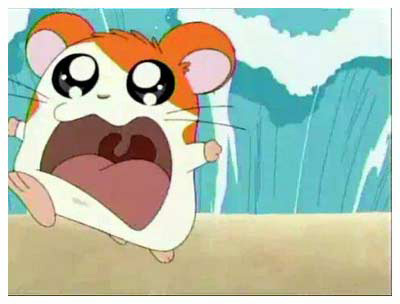 Near the end of Hamtaro: Ham-Ham Heartbreak, it is hinted that he has a small crush on Harmony. Boss really likes Bijou, but Bijou likes Hamtaro. Boss later in the series has a crush on another girl-ham called Gelato. Ribon (Ribon-chan? )/Bijou (Seiyū: Kazusa Murai, Voice Actress: Chantal Strand) - Owned by Maria. She is a somewhat unworldly hamster who loves her blue ribbons, but she is not above getting dirty when she needs to help her friends, and has been known to be generous and helpful. She used to live in France before moving to where she is now, but she feels attached to Japan and has even refused to go back to France. In the Japanese version, she speaks normal Japanese and adds the words "dechuwa" (most likely a hamster version of "desu wa") at the end of her sentences, while the American version of Bijou has a French accent, because, "Bijou," is French for "jewel", which is one word to accurately describe her personality. She also has an enormous crush on Hamtaro, and her feelings for him are eventually reciprocated. Mafura (Mafurā-chan? )/Pashmina (Seiyū: Rei Sakuma, Voice Actress: Jocelyne Loewen) - Owned by June. Considered to be a very maternal Ham-Ham, as she takes care of Penelope. She loves the color pink and always wears her pink scarf. Dexter and Howdy often fight for her affection, but she does not seem to notice. She feels that she is too young for a relationship anyway (she actually wishes for love in the Japanese version, however). It is revealed in a Japanese episode that Pashmina develops a crush for Dexter after he rescues her from falling into the river. Chibimaru (Chibimaru-chan? )/Penelope (Seiyū: Kaori Matoi, Voice Actress: Cathy Weseluck) - Owned by Kylie. Considered the youngest of all the Ham-Hams, Penelope is usually never seen without the cover of her yellow blanket (though a few seconds in the opening theme show her blanket coming off, revealing her brown fur). Although she is friendly to everyone, she feels particularly attached to Pashmina. Being innocent and naive, due to her age, she gets into trouble more often than most of the other Ham-Hams. In season two, she has shown some cross-species affection for Herbert the Pig, a boy by the name of Ethan, and a rabbit at Ethan's school. Unlike the other Ham-Hams, and perhaps because of her young age, Penelope can't say anything more than 'Ookwee!' or 'Ookyoo!' ('Ukyu!' in the original version). Noppo (Noppo-kun? )/Maxwell (Seiyū: Takako Honda, Voice Actor: Brad Swaile) - Owned by the eldest son of a bookstore owner (though it seems that the bookstore owner's daughter is the one who cares for him). He always carries a book with him, and is often turned to for information. He seems to know a lot about science and literature due to his love of reading. He is a little taller than the Ham-Hams, partially due to his tall ears. He has a crush on Sandy, though it is never initiated until Hamtaro tells him about Sandy's feelings. Torahamu-chan (Torahamu-chan? )/Sandy (Seiyū: Haruna Ikezawa, Voice Actress: Brittney Wilson) - Owned by Hillary. A sporty young girl Ham who carries a ribbon. Her interest in rythmic gymnastics have been influenced by Hillary, who is a gold medal gymnast. She has a crush on Maxwell. While in the English version it might seem that the two have confessed their affections, a Japanese episode confirms that they are not quite romantically involved yet. In the English version, she has a valley girl accent. Torahamu-kun (Torahamu-kun? )/Stan (Seiyū: Kouki Miyata, Voice Actor: Noel Fisher) - Owned by Noel. Sandy's twin (older) brother, who is often caught flirting with the other girls. As a result, he is often an annoyance to the other guys, especially Boss, Howdy, and Dexter. Initially, Sandy and Stan were separated, after Noel (who had a crush on Hillary) offered to take care of one of her hamsters. He is often seen shaking his maracas or riding his skateboard.Seemly Stan has a crush on Flora (the nurse ham), unlike other ham-girls Stan does not flirt with Flora. Maido (Maido-kun? )/Howdy (Seiyū: Yuu Sugimoto, Voice Actor: Paul Dobson) - Owned by Goldie. A Ham-Ham notorious for telling bad jokes, especially at the worst possible time. In the English version, he has a Southern accent, and has a kansai accent in the Japanese version. He often rivals for Pashmina's affection with Dexter, causing many fights between them. Neteru (Neteru-kun? )/Snoozer (Seiyū: Yuu Sugimoto, Voice Actress: Cathy Weseluck) - A mysterious hamster that Boss found in his hideaway (which would soon become the clubhouse). It is unknown where he came from. He is always sleeping, but often utters some helpful advice when the Ham-Hams are in need of it. In the english version, he talks with a lisp. Megane (Megane-kun? )/Dexter (Seiyū: Chihiro Suzuki, Voice Actor: Samuel Vincent) - Owned by Curtis. A refined hamster, who is incredibly smart. He loves Pashmina, but often battles with Howdy for her affection. However, their differing personalities also contribute to their many fights, especially when it comes to Howdy's jokes. His Japanese name is a pun: Megane means "glasses" in reference to the tan pattern of fur around his eyes that makes him look like he's wearing glasses. coincidentally, his owners are optomatrists. Kaburu (Kaburu-kun? )/Cappy (Seiyū: Ai Uchikawa, Voice Actress: Tabitha St. Germain) - Owned by Kip and Sue. One of the younger Ham-Hams, Cappy loves hats. The two hats he mostly commonly carries are his green swimming cap, and the giant saucepan that he usually is hiding under. While he loves his home, he does not like being spoiled, and looks up to Boss due to Boss's independence as a field hamster. He has developed some sort of a rivalry with Stucky, especially when it comes to hide and seek. Conversely, he is largely fond of Boss, and once ran away from home to live with him (episode 21; in the English dub, the dialogue was very suggestive to the start of a non-canonical friendship between Boss and Cappy). It is revealed in episode 53 that Cappy is a quarter Oxnard's size. Panda (Panda-kun?) (Seiyū: Yuko Saito, Voice Actor: Jillian Michaels)- Owned by Mimi. A Ham-Ham whose fur matches his name, he is the builder/carpenter of the Ham-Hams who built and repaired many things throughout the duration of the anime as well as the in the game. 8 Hamtaro, Please come Home! 12 The Legend of the Courageous Hamtaro! 17 Much Ado about School! 18 The Search for Dad's Glasses! 22 Boss is a Mom! 26 Let's Cross the Rainbow! 33 Hamtaro, the Super Sleuth! 37 Panda's Ham-Ham Fun Park! 40 The Blossoms Of Friendship! 44 I Love My Grandpa! 48 Ham-Ham Clubhouse in Danger! 58 Laura is Really Gone! 59 Boss, the Cool Ham of the Sea! 61 The Fresh Summer Breeze! 69 A Fortune Comes True! 73 A Breath of Autumn! 77 A Wonderful Santa Claus! 88 The Search for Spring! 89 Hamtaro and the Space Ship! 92 Hannah is in Love! 97 Who Stole My Shoe? When we work together it's much better! We like sunflower seeds. . .khrrmp khrrmp khrrmp. If she heads for trouble, we won't let her! Laura's gone to school, let's go to our Ham-Ham Clubhouse! But if we work together we can make their plans sink! 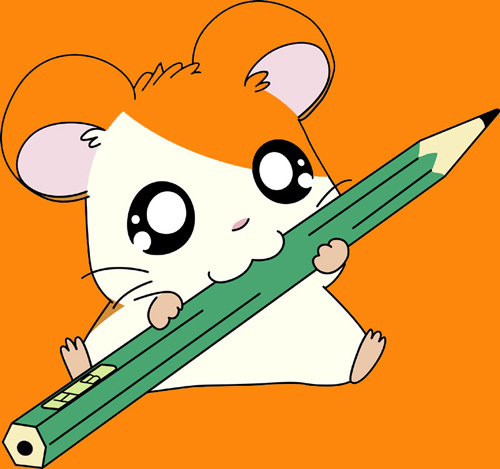 Hamtaro's here to help you! Hamtaro's team is for you!